(SHAPE) - Poke bowls (pronounced as “po-kay”) have been popular for a while now. Known for being nutrient-rich, they are a go-to for those looking for a healthy and wholesome meal. 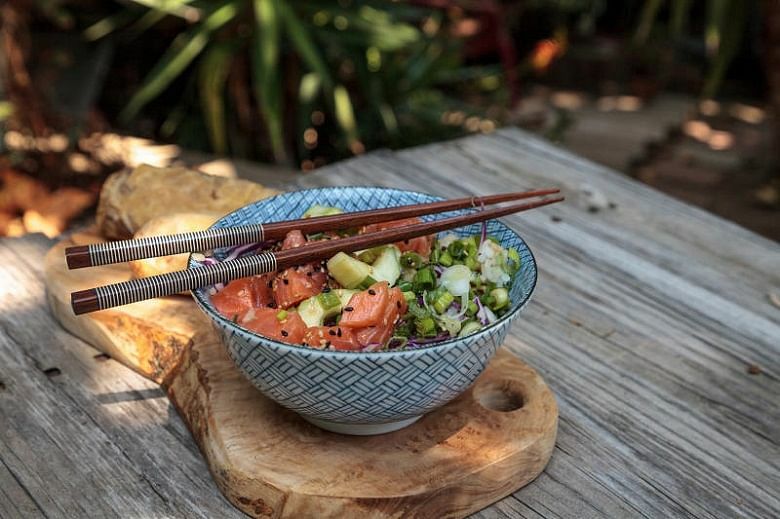 If you aren’t familiar with the poke bowl craze, it is a dish that originated from Hawaii and it contains a mix of rice and vegetables, topped with nuts, fruits and of course poke – chunks of raw marinated fish. Low in calories and high in fibre – this dish is perfect for those who are watching their waistlines. Despite the various poke bowl joints available in Singapore, they may not be as cost-friendly as some of us would like them to be. But this recipe will allow you to whip up your own poke bowl at a fraction of the price. An added bonus: it is well under 500kcal. 1. Bring the rice, water and salt to a boil at low heat for 40 minutes with the lid on. 2. Dice salmon into 1 to 2cm cubes, and mix them up with soya sauce, sesame oil, chilli and red or spring onion. 3. Boil vegetables al dente, and cool off in icy cold water. 4. Pat the vegetables dry and mix with chilli mayo, lime juice and spring onion. 5. Serve salmon and vegetables over rice.